Sarang the horse lives in a small home front on a busy market street. Cared for by an attendant family Sarang is treated as a beloved pet and is rented out for Hindu weddings - carrying grooms to their wives. 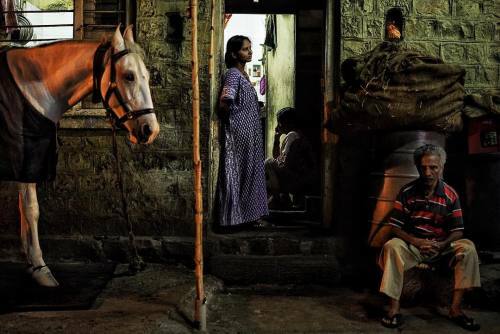 #photojournalism #documentary #reportage #streetphotography #kolhapur #india #horse #ahorseofcourse" By benlowy on Instagram.